A confirmed tornado in Decatur County on Thursday night destroyed 10 homes, damaged an additional 20 and pulled tombstones out of the ground in a cemetery, emergency management and weather service officials said Friday. No injuries were reported. The EF2 tornado, with wind speeds of 111 to 135 mph, was the only one confirmed to touch down in West Tennessee after the National Weather Service completed surveys of the damage Friday evening. National Weather Service meteorologists reported straight-line winds up to 90 mph but no other confirmed tornadoes in West Tennessee. The assessment in the Jackson area, however, was not very thorough, John Sirmon with the National Weather Service said Friday evening. The storms produced two rounds of tornado warnings, one Thursday afternoon and one Thursday evening. Strong winds knocked trees onto homes and cars and ripped down power lines, leaving thousands of people without electricity throughout West Tennessee. Another round of severe weather will be possible Sunday night into Monday morning. Three businesses also were damaged, including a restaurant that lost its roof. Many farm buildings incurred damage from wind and trees, and a grain bin in the Bible Hill community was destroyed. Sirmon said Sunday might bring similar weather conditions, though not as severe. National Weather Service meteorologist Danny Gant predicted severe weather to start again Sunday around midnight, continuing into early Monday morning. “There is a possibility of hail, heavy rain and isolated tornadoes,” Gant said. There’s a 70 percent chance of storms in the Jackson area Sunday night. Weather experts report a 20 percent chance of showers and thunderstorms today, though they said skies will remain cloudy. Emergency Management Agency officials throughout West Tennessee reported storm and wind damage from Thursday night that resulted in impassable roads, fallen trees and power lines down in many counties. By Friday afternoon, utility company officials said electricity knocked out by the storms had been restored in most counties. Gibson Electric spokeswoman Rita Alexander said Gibson County received some scattered outages but had no lengthy losses. “We were lucky,” Alexander said. “Our customers were not affected much.” At 9:30 p.m. Thursday, 5,200 residents served by Southwest Electric were without power, but by Friday morning that number was down to 85 homes, said Trent Scott, a Southwest Electric spokesman. He said the worst outages started in Madison, Tipton, Haywood and Chester counties. As of noon Friday Southwest Electric had restored power for all of its nine counties. Jackson Energy Authority spokesman Steve Bowers said about 1,500 customers were without power from multiple electric outages scattered throughout the JEA system Thursday night. But by Friday morning, power had been restored, outside of a few work-related power outages throughout the day. Madison County Emergency Management Agency Director Marty Clements said most of Thursday’s damage consisted of trees down, power outages and flash flooding that led to traffic build-ups. Officials said flash flooding was worst in Jackson at North Highland Avenue and Deaderick Street. One Westmoreland Place home incurred damage when a tree fell on the house, also crushing a car at the residence around 8:30 p.m. In Hardeman County, Emergency Management Agency Director Don Taylor said the storms resulted in damage to a tractor-trailer on Tenn. 18 North when a tree fell in front of it, causing some damage to the truck’s windshield and front end. A house in Hickory Valley, in the southern part of the county, was struck by lightning, but it didn’t catch fire, Taylor said. Taylor said no injuries were reported in either incident. Benton County officials reported a carport blown open in the Eva area, which had more wind and trees down than the rest of the county, according to officials. 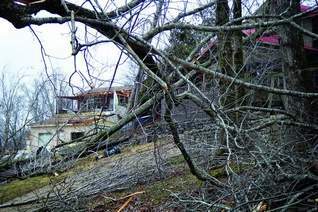 Several Crockett County homes were damaged on Tenn. 188 going toward Gibson County. Emergency Management Agency Director Joe Jones reported many power lines down, impassable roads and high straight-line winds. But most of the damage had been cleaned by Friday morning. Chester, Haywood, Dyer, Weakley and McNairy counties officials said they received little to no damage.